The “Armchair of Inquiries” – basically a symbol of the Inquisition, serving regularly, for hundreds of years, as the ideal, go-to tool for obtaining all the necessary information. In Nuremberg and Fegensburge, preliminary investigations were carried out in these chairs up until 1846. The “Armchair” presents itself as a wooden structure with metal or wooden studs and clamps for the limbs. 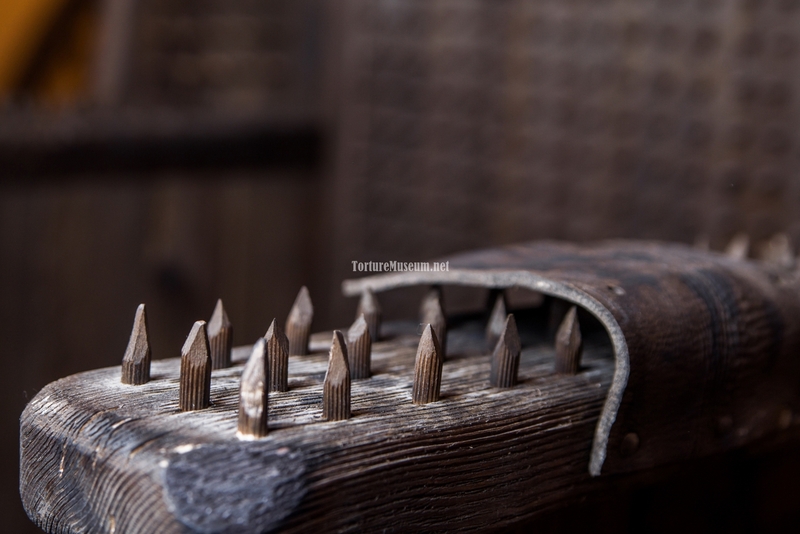 Through these binds the executioners had full control over their victims’ sensations of pain. The model of the chair was repeatedly modified, new torturous details being added in support. Those sentenced were stripped of their clothes and and seated on the chair which was dotted with many sharp points; points that went deep into the skin. 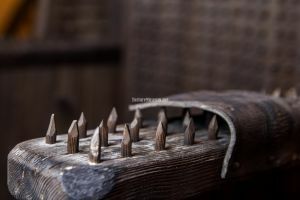 Incredible pain forced the victims to rise up in order to try and break away from the tips, but this only makes their wounds worse and their contact with the spikes inevitable. In times when it was necessary to tighten the device, it was done so by heating the iron seat. A fire could be kindled under the chair which turned the chair into a furnace. Spikes would be heated to a temperature of 100oC, leaving behind deep wounds and burns of third or fourth degree. After interrogations like this, the human body was similar to a sieve. 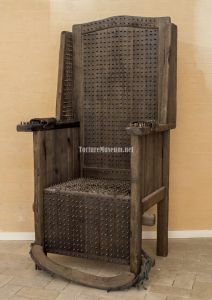 An interesting fact: the “Armchair of Inquiries” was successfully utilized not only in the Middle Ages, but even into the 20th century, such as during interrogations in concentration camps. Have you ever dreamed of one day sitting on a throne? Admit it, you know you have! Now I’ll show you a throne that even the most pure-blooded kings would refuse. Do you see that chair from behind? They call that an “Armchair of Inquiries”, and with its help, inquisitors extract information from criminals. 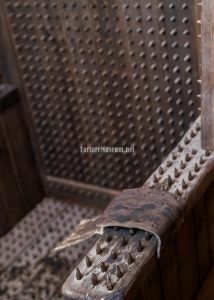 Its seat, backrest, and armrests are dotted with dense rows of sharply-honed spikes. Placed on the armchair, a man might be able to sit on them for a short time, avoiding skin punctures. The real torture begins if his ankles and wrists are entrapped in steel clamps, pressing them down. The spikes dig into the skin of his back, arms, legs, and buttocks, and the criminal begins fidgeting from the continual pain. His reflex being to get up, however, subsequently drives the spikes deeper under the skin. He should give up the necessary information within two to three hours, and if the jury can’t spare the time, a bonfire is set alight under his seat. Now the pain in his open wounds becomes truly hellish. The chamber fills heavy with the stench of burned flesh. The criminal shrieks and begs that they free him in exchange for a God-honest confession, and anything else that the torturers wish for. Therefore, it’s not worth it to dream about royal laurels. You never know when they might come for you next.